When your car battery dies once, it may be tempting to just write it off as a fluke. Batteries can die for a huge range of different reasons, and there’s always the chance that whatever went wrong won’t go wrong again. But when your car battery keeps dying over and over again, it’s a pretty safe bet that there’s an underlying problem that needs to be dealt with before you end up stranded somewhere. 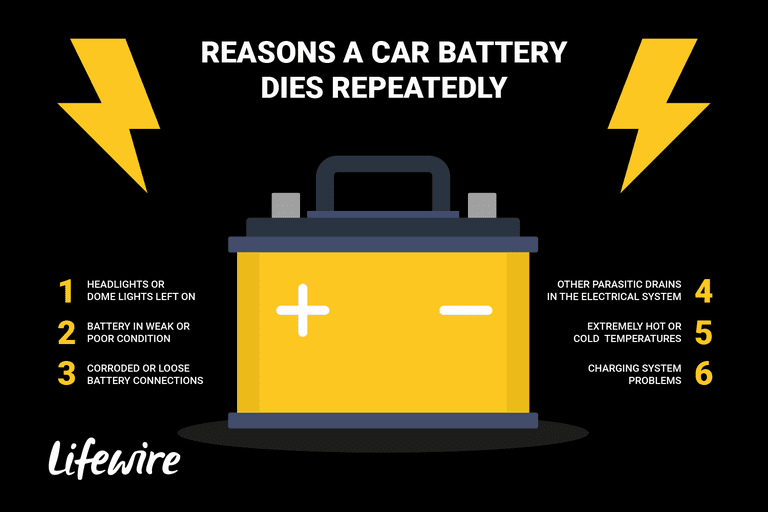 The list of issues that can cause a car battery to die is so long as to approach neverending, but virtually every battery killer out there can be shoehorned into the three basic categories of battery problems, electrical system problems, and simple user error. Some of these can be dealt with at home, and others will probably require a visit to your mechanic, but there’s no way to know for sure until you roll up your sleeves and dig in. It’s also important to note that when most people talk about a battery dying repeatedly, they are talking about a situation where the vehicle won’t start after it has been parked for any length of time. If your battery seems to die while you’re driving down the road, it’s more likely that you have some type of problem with the charging system (we’ll cover that situation as well). What Causes a Car Battery to Keep Dying? Some of the most common reasons for a car battery to die repeatedly include loose or corroded battery connections, persistent electrical drains, charging problems, constantly demanding more power than the alternator can provide, and even extreme weather. Some of these problems are enough to kill a battery on their own, while others are usually coupled with a battery that is already weak or on its last legs. Headlights or dome lights left on​​​. Headlights, or even a very dim dome light, will drain a battery dead overnight. Make sure to check for any interior lights when it's dark outside. Some headlights are designed to remain on for a while, but a malfunctioning system may leave them on permanently. Battery in weak or poor condition. ​A poorly maintained or weak battery may not hold a charge very well. Even small drains, like the memory function in your car radio, may kill a very weak battery. Corroded or loose battery connections. ​Corroded battery connections can prevent the charging system from topping off your battery when you are driving. Loose battery connections can also cause problems. Other parasitic drains in the electrical system. ​Parasitic drains can be difficult to find, but they are fully capable of killing batteries dead. Common drains include glove box and trunk lights that come on, or remain on, when they shouldn't. Hot or cold weather won't kill a battery that's new or in good shape, but a weak or old battery may fail in extreme conditions. Extremely hot or cold weather can also magnify other underlying issues. If a battery seems to die when you're driving, the charging system may be at fault. Loose or stretched belts and worn tensioners can prevent an alternator from working. Car batteries are designed to power headlights, dome lights, and various other accessories whenever the engine is off, but they have a very limited capacity to do so. That means if anything is left on after the engine is shut off, the battery will almost certainly die. Leaving the headlights on can kill a weak battery in the amount of time it takes you run a short errand like shopping for groceries, but even a small interior dome light can drain a battery dead overnight. So if you're dealing with a battery that goes dead over and over again, it's worth checking it out at night when it's dark out when a faint or dimmed dome light will be easier to see. Some newer vehicles are also designed to leave the headlights, dome lights, or even the radio on for a while after you shut the engine off and remove the keys. When everything is working correctly, you can walk away from a vehicle like this, and everything will shut off on a timer. If you come back half an hour or an hour later, and things like the headlights are still on, that's probably why your battery is dying. If you don't see anything obvious, like headlights or a dome light left on, then the next thing to check is the battery itself. A lot of battery problems can be headed off with basic maintenance, and a poorly maintained battery won't hold a charge like it did when it was new. If your battery isn’t sealed, then it’s important to make sure that each cell is properly filled with electrolyte. If you look inside the cells and see that the electrolyte level has dropped below the tops of the lead plates, that’s a problem. Battery cells should be topped off with distilled water, but going straight to the tap is usually fine depending on the quality of the water where you live. You can also test your battery with an inexpensive tool called a hydrometer, which allows you to check the specific gravity of the electrolyte in each cell. If one or more cells is very low after fully charging the battery, that’s a sign that the battery needs to be replaced. Another way to check your battery is to use a more expensive tool called a load tester. This tool puts a load on the battery that simulates the draw of a starter motor and allows you to see both the loaded and unloaded battery voltage. Some shops and parts stores will load test your battery for free if you don’t own a load tester, while others will charge a nominal fee. If you do decide to pick up your own load tester, it's important to remember that batteries that are shorted internally can explode under the right conditions. This is why it's so important to wear protective gear when working around a battery. When you perform a visual inspection of your battery, you may notice corrosion around the battery terminals, cables, or connectors. The corrosion may not even be noticeable in some situations, or you may see large white, blue, or green blooms of corroded material. If any corrosion is present between your battery terminals and cable connectors, it will interfere with the ability of the starter motor to draw current from the battery and the ability of the charging system to top the battery off. Battery corrosion can be cleaned with baking soda, water, and a stiff-bristled brush. However, it is vitally important to avoid getting any baking soda inside the battery cells. It’s also important to note that if you allow a mixture of baking soda and corrosion to remain on the surface of your driveway, or the floor of your garage, you may end up with a stain that is difficult or impossible to remove. Corrosion can also be removed from battery terminals and cable connectors with sandpaper or a specially designed tool. These tools usually take the form of wire brushes that are very easy to use. After using one of these tools, the battery terminals will look bright and clean, and you’ll get a much better electrical connection. It’s also extremely important for the battery connections to be tight. If you find that the battery cables are loose, there’s a good chance that you have located a big part of your problem. If you are able to trace your ground and power battery cables to the frame, starter and junction block or fuse box, you will also want to make sure that these connections are tight and free from corrosion. If your car battery keeps dying over and over again, one of the simplest explanations is that there is some kind of drain on the system that persists after you remove the keys and lock the doors. Even if you've already ruled out obvious things like the headlights and dome light, there may still be a drain in your system. The easiest way to check for a drain is to disconnect a battery cable and check for current flow. If you use a multimeter for this purpose, it’s very important to use the highest possible amperage setting. Doing otherwise runs the risk of blowing an expensive fuse inside your meter. Some meters also include an inductive clamp that can check for current flow without disconnecting anything. You can also check for a drain with a test light, which is less precise. This is done in the same way, by disconnecting the negative battery cable and completing a circuit between the negative battery terminal and ground. If the test light illuminates, then there is some type of drain present in the system. The problem with using a test light is that it can be very difficult to tell how much of a drain is present just from the brightness of the light. Some of the most common causes of a parasitic drain include trunk, glove compartment, and other lights that are on due to some type of malfunction. These and other interior lights are designed to shut off automatically, and if they fail to do so, they are fully capable of draining a battery dead overnight. In most cases, the only way to track down a parasitic drain is through a process of elimination. The easiest way to go about this type of diagnostic is to leave your multimeter or test light connected and remove individual fuses until the drain disappears. You will then need to identify the corresponding circuit, which will help you track down the specific component that is causing a problem. Extremely hot or cold weather can also spell trouble for your battery, but this will usually only be an issue if the battery is already weak. If you test the battery, and it checks out fine, and the connections are tight and clean, then weather shouldn’t cause it to die repeatedly. Charging system problems can also cause a battery to die repeatedly, although you will usually notice some level of drivability problems as well. An easy thing that you can check at home is the alternator belt, which should be relatively taut and free of cracks. If the belt seems loose, it may actually prevent the alternator from generating enough power to charge the battery in addition to running everything else. What If Your Battery Keeps Dying When Driving? If it seems like your battery keeps dying while you’re actually driving your car, the root problem probably isn't the battery. The purpose of a car battery is to power the starter motor and to provide electricity to run accessories like lights and your radio when the engine is off. Once the engine is running, the charging system takes over. So if it seems like the battery is dying with the engine running, there’s probably an issue with your charging system. As previously mentioned, the only part of the charging system that you can really check or test without special equipment is the belt. If your alternator belt is loose, you may be able to tighten it. You may also have a belt that uses an automatic tensioner, in which case that can also be the problem. Belts can also stretch with age. If you have a multimeter with an inductive clamp, you can technically check the output of the alternator, but this type of diagnostic is difficult without more specialized tools and a knowledge base pertaining to the specific alternator. For instance, attempting to test an alternator by disconnecting a battery cable while the engine is running is not a good idea if you drive a modern vehicle. Some parts stores and repair shops will test your alternator for free, and others will want to charge a diagnostic fee. It’s important to note, however, that there is a difference between a simple test and an in depth diagnostic that actually gets to the root of the problem. In most cases where an alternator isn’t charging and the engine actually dies, it’s simply a case of a bad alternator that needs to be rebuilt or replaced. However, there are actually several reasons that a car’s electrical system might cut out when driving, and even more reasons for an engine to simply die. While it’s true that every single battery has to die eventually, the key to prolonging the life of a lead acid battery like the one in your car is to keep it well maintained and in good working order. If you’re dealing with a situation where your battery goes dead over and over, there’s a good chance that every time it dies like that, the ultimate lifespan of the battery is shortened. By keeping on top of corrosion, making sure that the battery connections are tight and secure, and not allowing the electrolyte in a non-sealed battery to drop, you can actually help your battery last much longer. There may not be a lot you can do to avoid other issues, like a sudden parasitic drain, but dealing with that type of problem in a timely manner can also help prolong the life of your battery. A battery tender can also help in the winter, if it gets especially cold where you live, or if you don’t plan on driving your car for an extended period of time.